Sonny Payne has since 1951 been the regular host of KFFA's King Biscuit Time radio show in Helena, Arkansas. The show is the longest-running blues broadcast and was the first to feature live blues on the air, beginning with performances by Robert Lockwood Jr. and Sonny Boy Williamson II. The latest from APO Records and Blue Heaven Studios...blues so raw and real they'll make you sore. There's no surprises here - just straight-ahead force. The songs are standards, some of 'em covered thousands of times. 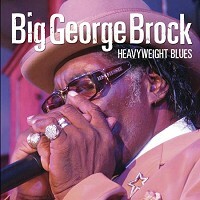 But NOBODY, that's a guaranteed NOBODY, comes closer to evoking the real feel of Muddy Waters or Howlin' Wolf than Big George Brock. His voice is as rich as fertile soil. But this isn't some imitation-contest record. Big George has got the goods all his own and has had 'em on display since the 1950s. He's a former Heavyweight boxer, and just like with the best of that sport, he'll gladly tell you what's coming. You still can't get out of the way. Recorded at Blue Heaven Studios, Salina, Kansas. Big George is so original and innovative with his style. This album is one to get to get. But, see him in concert for yourself to see why he's one of the best. See you there ! !